There wouldn't be much to attract you to the rather barren island of Komodo if it weren't for one rather unusual resident: the giant lizard dubbed the "komodo dragon." The reptiles, which grow to three meters (10 feet) long and 100 kilograms (220 punds), are found only on Komodo and it's neighbors Rinca and Flores. Despite this singular attraction, and others, the Komodo National Park is not exactly over-run with tourists. The main reason for that is probably the difficulty in getting there. The quickest way to get to Komodo Island is to fly to the "Komodo" Airport at Labuan Bajo on Flores Island, then take a two to three hour boat ride to the park station. As a result, Komodo seems to attract mostly adventure travelers with a lot of time, who stay on to see some of the other sights of Flores, or those interested in the fantastic scuba diving found in the waters around Komodo. Komodo is particularly challenging for the independent traveller, as there is very little infrastructure built up for visiting the park. Planning your trip in advance is quite difficult, unless you use one of the tour operators listed here. There are very few hotels in Labuan Bajo, almost none of them with a web presence for you to book in advance. Hotels will - naturally - arrange transport to Komodo for you, but your only other option is to make your way to the docks and negotiate with a boat yourself. If you like snorkeling, the best way to see the park would be to join one of the live-aboard cruises to the area. 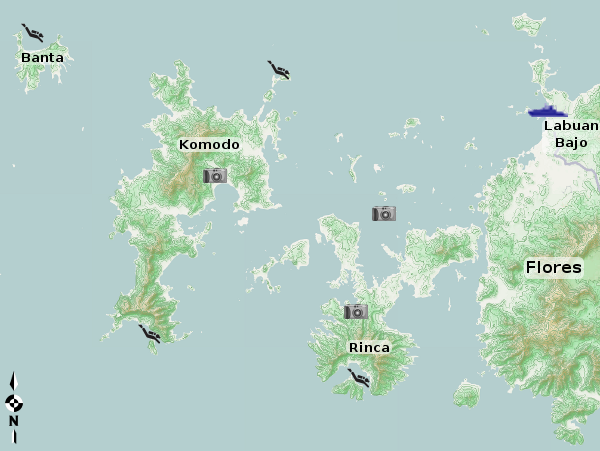 If you're plannng your own itinerary, then ideally you want to visit Komodo, or Rinca, to see the dragons in the morning. This is when they're supposed to be at their most active. However, you will almost certainly spot them at any time of day. If you want to take in Bat Island, then you need to plan on spending a night on a boat.